The mountains surrounding Lombardy’s Lake Iseo are the backdrop to the Mona Lisa. 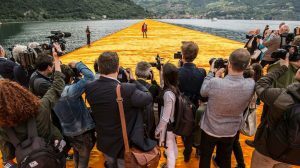 In 2016 they became the setting for another stunning art work, Christo’s long-cherished dream “The Floating Piers”, a golden jetty that allowed visitors to walk across the lake. This fascinating documentary (in English and Italian) captures the tension, angst and inspiration as the project came to fruition, bringing together artist, engineers, bureaucrats, volunteers, and thousands of the general public.